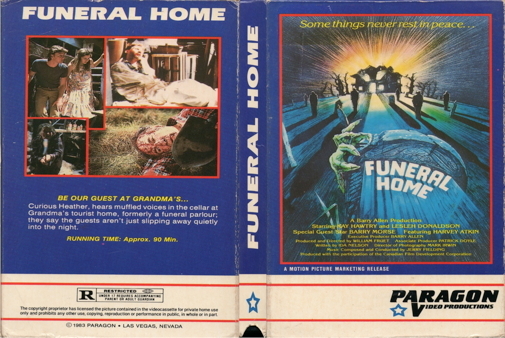 A low-key, atmospheric Canadian production, Funeral Home (aka Cries in the Night) makes effective use of the title setting, which has been converted into a bed & breakfast by Maude Chalmers (Kay Hawtrey) after the demise of her less-than-popular husband -- known throughout the town as "Chalmers the Embalmer." Maude's pretty granddaughter Heather (Lesleh Donaldson) arrives for a summer visit, and soon begins to hear weird, guttural moans and sobs from the padlocked cellar; before long, assorted obnoxious guests at the inn find their welcome revoked -- violently. Despite a nerdy deputy's obvious crush on her, Heather is unable to convince him that evil forces are lurking beneath the Chalmers house, and she decides to investigate on her own.